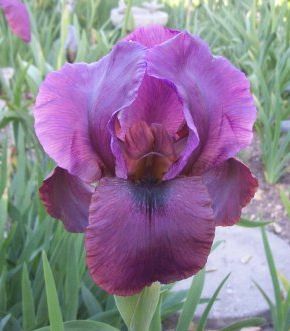 'Desert Plum' OGB ( Ben Hager, R. 1991). Seedling AR417OLvMvSlk. AB, 34" (86 cm). Midseason late bloom. Smokey mauve purple, silky texture; black maroon signal; bronze black beard. AR3498: ( 'Syrian Moon' x Rich R73-176D: ((( 'Bagdad Beauty' x 'Pink Formal') x 'Welcome Reward') x ('Welcome Reward' x (('Bagdad Beauty' x 'Orchid And Flame') x 'Kalifa Hirfa')))) X AR3379: (( 'Bethlehem Song' x 'Welcome Reward') x 'Moon Star'). Aril Patch, 1992.